After genotyping, we merged both HapMap and 1,000 Genomes genotypes with the Popres/Iceman-merged dataset, resulting in a final analysis dataset containing 125,729 SNPs. PCA was then performed on all samples, excluding the five 1,000 Genomes samples, which were subsequently projected onto the PC space inferred from the rest of the dataset. UPDATE: The Iceman's genome can be found at the http://icemangenome.net site. We addressed this issue here by analysing the G2a4-defining L91 SNP in 7,797 chromosomes from 30 regions across Europe. Fig. 3d shows the spatial frequency distribution of G2a4 throughout Europe. The highest frequencies (25 and 9%) occur in southern Corsica and northern Sardinia, respectively, (Fig. 3e) while in mainland Europe the frequencies do not reach 1%. 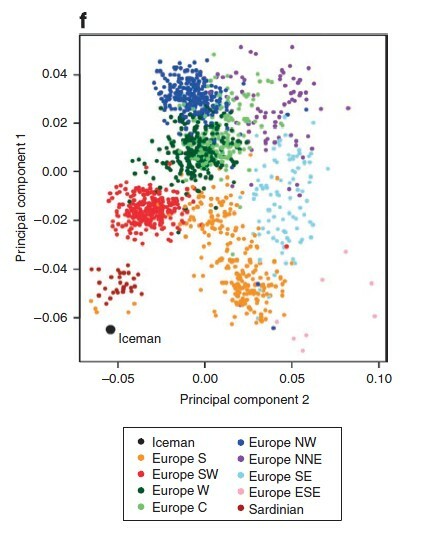 In terms of autosomal DNA, the Iceman clearly clusters with modern Sardinians, and also appears slightly more removed than them compared to continental Europeans. Interestingly, at least as far as the PC analyssi shows, Sardinians appear to be intermediate between the Iceman and SW Europeans, rather than Italians. Perhaps, this makes sense if the Paleo-Sardinian language is indeed related to languages of Iberia. I don't see a downloadable version of the Iceman's genome at the icemangenome.net site, but I've asked the corresponding author for a PLINK/EIGENSOFT version of it. I anticipate that, as I've predicted, this will appear to be largely "Mediterranean" according to Dodecad v3, or "Atlantic_Med" according to the newer K12b calculator. It appears that there has indeed been Sardinian continuity against a backdrop of European discontinuity. The Iceman's genome argues strongly in favor of the latter hypothesis: continental Europeans, or, at least North Italians c. 5,300 years ago were more Sardinian-like, and they have become less Sardinian-like up to the present, probably due to an influx of new populations, carrying new alleles. As more ancient DNA is recovered, we will slowly witness the transformation of gene pools over time. The Tyrolean Iceman, a 5,300-year-old Copper age individual, was discovered in 1991 on the Tisenjoch Pass in the Italian part of the Ötztal Alps. Here we report the complete genome sequence of the Iceman and show 100% concordance between the previously reported mitochondrial genome sequence and the consensus sequence generated from our genomic data. We present indications for recent common ancestry between the Iceman and present-day inhabitants of the Tyrrhenian Sea, that the Iceman probably had brown eyes, belonged to blood group O and was lactose intolerant. His genetic predisposition shows an increased risk for coronary heart disease and may have contributed to the development of previously reported vascular calcifications. Sequences corresponding to ~60% of the genome of Borrelia burgdorferi are indicative of the earliest human case of infection with the pathogen for Lyme borreliosis. This is an amazing paper that, in my opinion, potentially transforms Western European Neolithic archaeology. Iceman’s Y chromosome is derived for L91, a SNP that apparently is quite rare in Europe outside of Corsica and Sardinia. Also Iceman’s autosomal data seem to cluster with present day Sardinians. The question is whether Iceman’s immediate ancestors were somehow from Sardinia (Iceman himself appears to have lived most of his life in the Tyrol region) or whether the Sardinian autosomal pattern was in fact much more widespread across at least Northern Italy during and/or prior to the Neolithic Era and was subsequently replaced during the Bronze/Iron Ages.
" Continental Europeans have gained alleles that were not present in their Sardinian-like ancestors"
Bronze age migrations to the rescue! Those Europe_S that cluster with sardinians, who are they? Basques? Corsicans should be sampled for genome-wide autosomal analysis sometime; they may turn out to be even more Ötzi-like and thus more native than Sardinians are. Corsicans would cluster with Tuscans, in fact there has been already an autosomal study on them. Those Europe S are Italians, and particulary those ones close to Ozi are also Sardinians, but from a different sample. Dienekes, why didn't you include the analysis with the near east? Otzi, is more Middle Eastern than most Europeans and most modern Italians. This not only suggests post neolithic migrations but migrations which brought down the level of middle eastern. Which study are you referring to? 'The question is whether Iceman’s immediate ancestors were somehow from Sardinia (Iceman himself appears to have lived most of his life in the Tyrol region) or whether the Sardinian autosomal pattern was in fact much more widespread across at least Northern Italy during and/or prior to the Neolithic Era and was subsequently replaced during the Bronze/Iron Ages". I agree with what Dienekes implied: the latter (The Iceman's genome argues strongly in favor of the latter hypothesis: continental Europeans, or, at least North Italians c. 5,300 years ago were more Sardinian-like, and they have become less Sardinian-like up to the present, probably due to an influx of new populations, carrying new alleles). The study is Tofanelli et al. He is autosomally like the Sardinians, our best representative of the first people into Europe, the Atlantic coastal folk. If Otzi's fore-fathers came from outside Europe they came in low numbers and married locally leaving no autosomal trace in Otzi. He lived a hunter-gather lifestyle as has been established in a previous paper, despite living near the cusp of the European neolithic. Culturally he appears to be pre-neolithic person, not a post-neolithic person. We now have the oldest archaeological Y-haplogroup ever found in Europe (varieties of G2), linked to the population most associated with the first people in Europe (Sardinians as representatives of the Atlantic coastal migration). Perhaps we were wrong about the men of paleolithic Europe being I. Perhaps they were G. In the south anyhow. Still we have to be careful in extrapolating too much from one man. Perhaps his parents migrated from Sardinia. Its not that far away. Seems like L91 no longer is G2a4, but now rearranged to G2a2b (although they did not test for L223). Many branches of G2a are thinly distributed throughout all of Europe - so, considering the Corsica/ Sardinia connection, are they neolithic or pre-neolithic? Vona et al., which investigated more genetic markers and sampled much more individuals than Tofanelli et al., reached the exact opposite conclusion: Corsicans are genetically closest to Sardinians and greatly differentiated from French and Tuscans. The problem with both Tofanelli et al. and Vona et al. is that they both investigated a fairly limited number of markers. I have never seen a study of Corsicans that investigates a large number of markers.
" We now have the oldest archaeological Y-haplogroup ever found in Europe (varieties of G2), linked to the population most associated with the first people in Europe (Sardinians as representatives of the Atlantic coastal migration)." You think he's paleolithic European... Then what migration would make Paleolithic Europe less middle eastern, even after the contribution of the neolithic? I think he has neolithic heritage (recent middle eastern) whether his lifestyle was that or not. In simple terms, it seems to me that Oetzi is more similar to Sardinians and Corsicans than any other modern European people. Being curious, I googled "Sardinian Women". After seeing pictures of Katerina Murino and some other Sardinian women, I am beginning to think that Oetzi, if he lived today, would go quite unnoticed in Southern Europe and the Middle East, while he would look quite out of place in Northern Europe. It is, ofc, quite ironic that he was given a German name. Perhaps they should change that to a Sardinian or Corsican traditional name. We'll call him Gavin, now. I must say that this confirms that the oral tradition has a knob of truth. In his "Origines" Marco Porcius Cato refers of peoples who inhabited Italy before the arrival of Aeneas and his people. In fact before the arrival of the Italics people who have supplanted them. In particular, recalls the Euganei, which were driven by the Venetics in the valleys of the Adige, but it is clear that they should be treated the Aborigines, the people that had lost the name already in ancient times. I agree with Achaean's points. Vona et al. 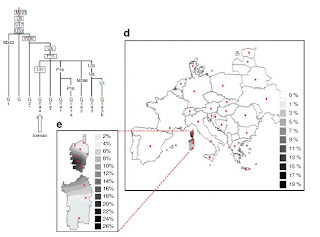 is the most detailed autosomal genetic study on Corsicans I have seen so far, and it strongly points to a close genetic relation between Corsicans and Sardinians, the two populations seem to be parts of a gene pool distinct from modern European mainlanders. Also, from now on, I won't call the iceman Ötzi. A Corsican or Sardinian name would be much more appropriate for him. >"quite ironic that he was given a German name"
He has no real "German" name. He was named after the valley his corpse was found in. Wich is "Ötztal" (translates to: "Ötz Valley"). "Ötz" itself is the name of a town inside the valley. The medieval name was "Ez". Thats similiar to the "Neanderthals". Thats a valley in Germany. the valley in wich the worlds first Neanderthal skull was found. Its even more funny than "Ötzi" as the whole species is literate named "Inhabitant of the Neander Valley" even if they are found in the middle east. Technically a name like "Ötzi" is comparable to using the name "Neanderly" on the mummy of a neanderthal girl. I already know the etymology of the name Ötzi. My objection to the name is not because it is a German name, which we know it is not, but because that it is a German-sounding name. Rather than giving a nickname based on the place of origin, it is more appropriate to give him a name based on genetic affiliations. The name Neanderthal is not a good example, Neanderthal (short form of Homo neanderthalensisis or Homo sapiens neanderthalensis) a taxonomic name while Ötzi is a nickname. genes don't talk languages, and while it would be most appropriate to call Ötzi by a name from the language he spoke, we don't know what that language is, as people of that time were illiterate. It is very interesting that modern Italians appear to be intermediate between Otzi/Sardinians and SE/ESE Europe. This appears quite consistent with the idea found in Dionysius of Halicarnassus and his sources about the Helladic/Anatolian origin of many population elements in Italy.
" It is very interesting that modern Italians appear to be intermediate between Otzi/Sardinians and SE/ESE Europe." No, that would be the south Italians of which otzi was not, in his time. And when you look at the larger picture analysis that including the middle east and north Africa, otzi is even more middle eastern than most modern Italians. I'm also guessing that more relevant than an intra European analysis on an ancient. I'm not sure what you are objecting to. It is very clear in all analyses that present-day Italians are intermediate between Otzi/Sardinians and Greeks/Anatolians. "Perhaps we were wrong about the men of paleolithic Europe being I. Perhaps they were G. In the south anyhow." The route may have been followed more than once and the scale involved may have been more of a thin ribbon along the coast rather than a big wave. I'm saying it doesn't look as if northern Italy was like otzi and then a bunch of anatolians came there. Maybe the anatolians came to southern Italy after the time of otzi but Im not sure if otzi could be used to make that point since he was an ancient northern Italian. "You think he's paleolithic European... Then what migration would make Paleolithic Europe less middle eastern, even after the contribution of the neolithic?" I think he is basically an Atlantic coastal type. I think at the end of the paleolithic the population of Europe included a lot of other influences also (river migrations etc). Most Italians are within the envelope that can be produced by extending the edges of the Sardinian/Otzi cluster to meet the edges of the "Europe SE" cluster. Only the southernmost (genetically) Italians fall outside that envelope, and in their case, they appear to be intermediate between Sardinians/Otzi and Turks. I'm pretty sure that if POPRES had samples of southern/Aegean/Anatolian Greeks, they would occupy the sparse space between the northern Greeks of POPRES and the Turks/Cypriots/south Italians. So, yes, it does appear that modern Italians are different from Sardinians/Otzi in a Balkan/Anatolian direction. Dieneke, do you know where the POPRES Greeks and Turks are from? Simply put, the question is how ancient Northern Italians, represented by otzi, became modern Northern Italians. Modern Sardinians are not ancient Northern Italians, so they shouldn't even be included. Even still, you can't draw a line between any two individuals of otzi, the sardinians, and the ESE and have it cross the northern Italians. So even if you were to use any combination of the most extreme individuals (major bias) you can't create the north Italians. What is that? The balkans has a very different range from ESE. Your original argument involved the Helladic/Anatolian cluster, which is different from balkan, and wrong. I could see how how a balkanic migration could transform ancient northern Italy. Actually to simplify my criticism I should have just said that the most northern individual of otzi, the sardinians, and the ESE is still more southern than the northern Italians. Ergo those populations could not possiblly create the modern northern Italians. "I think he is basically an Atlantic coastal type. I think at the end of the paleolithic the population of Europe included a lot of other influences also (river migrations etc)." Really? I didn't know. I though the "other" influences came with the neolithic. Can you show me a link? Completely irrelevant but the thing that intrigues me the most is why they didn't take his axe? I think it was a murder by someone in his community. The murderer took his arrow as arrows are like a fingerprint. He did not take the axe because they were valuable and I imagine his community knew it was his. Anyone with the axe would be assumed to be the killer. Well for starters U was present in the European paleolithic and it hasnt been found in the south (in the paleolithic), just the north. Those women did not parachute in. Plus there is archaeological evidence of folk moving along the rivers. The Gravettian folk for were not part of the Atlantic coastal movement. "Anyone with the axe would be assumed to be the killer." Yes, but assuming an axe like that would be very rare and valuable at the time - which might be a wrong assumption? - that tells you a lot about the killer(s). The Liburni were a people living on the coast of today's Croatia in 1000 BC. They were in Roman time sailors and pirates and were subdued and rapidly absorbed in the second century BC. They spoke a language similar to the Latin-Faliscan and the Venetics, and this is the basis for the rapid assimilation. The Venetics were absorbed by the Romans without violence, and very quickly too, and this always happens when the languages ​​of the two peoples are very similar. The ancients were aware of the similarities and invented myths to explained this with tales of heroes who founded the lineage of those peoples (Eneas and Anthenore, the two troian heroes). Today, many scholars believe that the Liburnians were the remains of the Italiacs who lived in the region of Serbia and Croatia, before to emigrate to Italy. the worst thing that you can do is searching for representative photos of sardinians in google images, many of those people are not either sardinians, and they don't represent average looking people. I Think Murino has a typical sardinian face. However you can check here the faces of Sardinian women. MOCKBA, Ogliastra in in the SW of Sardinia, while Oetzi is more related with SE Corsicans end North Sardinians (Gallura). The previous study claimed that the population of Ogliastra descends directly from the nuragic period and is the population remained more isolated and homogeneous, but not that is the oldest. It’s no real issue for me, but I always got the impression that all these Ötzis reconstructions look a bit to Central European,like the lack of body hair. True, but I hope that the glass might end up "half full". As evidence of isolation, they demonstrated that more than half of the study subjects were born in one of the 4 villages. But the same figure also shows that about 20% of the study objects were born in Sardinia outside of Ogliastra, if I recall it right (I think that the distribution has been published in their 2006 publication). So chances are that despite the relative homogeneity of their population, the project will still be the first to give us a snapshot of genome diversity across the whole island?